Well, it was a slow week, only bought one e-book and it's really just a novella. Which is not bad at all. Not adding to the TBR mountain extraneously is always good! I still got some other awesome goodies though too! First I won an awesome Chicagoland Vampires swag pack from Awesomesauce Book Club! I got a mouse pad, stickers, bookmarks, an I survived Hard Bitten button, and a postcard! Plus a bookmark and card from the Ambers! I love it! 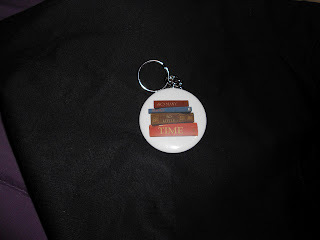 Then I ordered some things from Zazzle since they sent me a coupon! I couldn't really pass that up! I got a 13 to Life shirt! As you know I adore this series and decided to get this one. I liked the Pietr shifting from a wolf to guy shirt, but I just loved the Live Life Fiercely saying on this one! I also got this key chain. It's a little hard to see since I couldn't get the internet photo to cooperate. 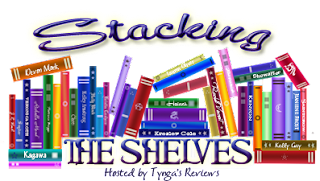 But there's a stack of books and the spines say: So many books, so little time. Because ain't that the truth! Pocahontas 1 & 2 Combo pack, got the Blueray one so my niece can have the movies too. Basically got 4 movies for $30! And the other is JAWS! Which was based on a book! That I read! It's Universal's 100th Anniversary edition, Blueray copy! This one I actually won in a contest from our newspaper. They've been doing them a lot lately and I've entered quite a few. Never won. Had this one on DVD, but then saw the special (Universal) anniversary Blueray edition and thought, why not? All you do is mail in the entry form! Was pretty surprised that I won this one! Had a laugh with my mom about it, because out of all the contests we've entered in the paper for movies, we win this one! A movie we'd seen 1000's of times already! And that was my mailbox haul! So pretty good! Only added a novella to the TBR mountain and got some other bookish goodies and two movies! Yay! Awesome swag! 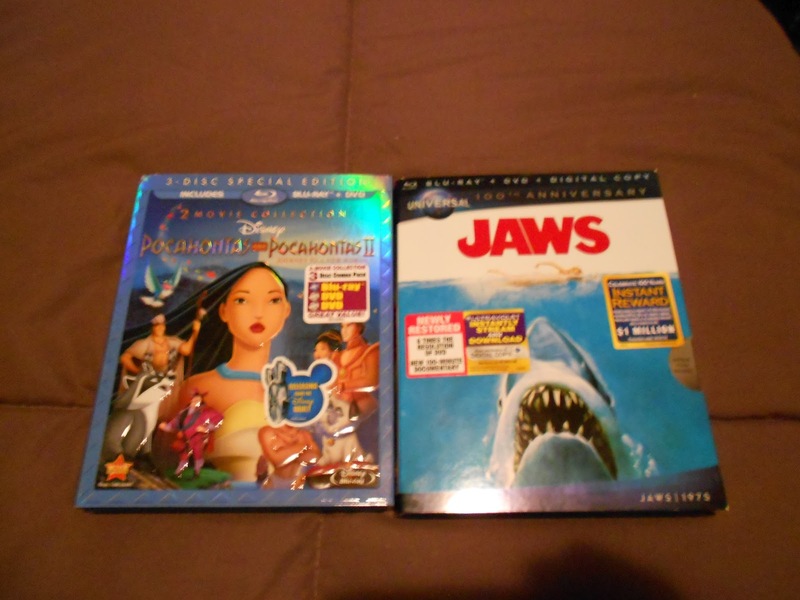 And hey Jaws Blu Ray! Cool! Thanks for stopping by! Ooh what fantastic stuff! I love the look of all of the things you got this week - especially that cute little keychain! I totally understand the need for a quiet week - I've also had one! Pocahontas <3 I love the songs in the second movie even when it wasn't as good as the first one. Hope you have a fantastic week! Loved your t-shirt, Jessica and great swag! Still need to read Amanda Carlson myself. Well done for not increasing your TBR pile. Enjoy! LOVE the T-shirt!! Sooo fitting and cute! LOL ;p And I have heard so many talk about Blooded...will have to check it out! Great haul this week! Hope you enjoy the book and your amazing goodies! ;p Also, thank you for stopping by My StS post! Nice mailbox. Swag is always fun to get! Happy reading and watching. Well even if not a lot of books, blooded is really great! Happy reading! Cool stuff! I want to read Amanda Carlson new series as well. There's a Pocahontas 2? I never knew that! Thanks for stopping by my STS! I just met Amanda Carlson at Authors After Dark - she's so nice but I had never heard of her book before. Oops. I'm definitely going to check it out. I saw the last 13 to Life novel at the book store yesterday. I got Blooded too, heard so much about it I had to buy it! great haul! Love your swag ^_^ & lol @ you seen those movies 1000s of times. It's always exciting to win ^_^ Love the t-shirt and the keychain! so cute! I haven't heard of those books, but they def sound good. Hope you enjoy them! 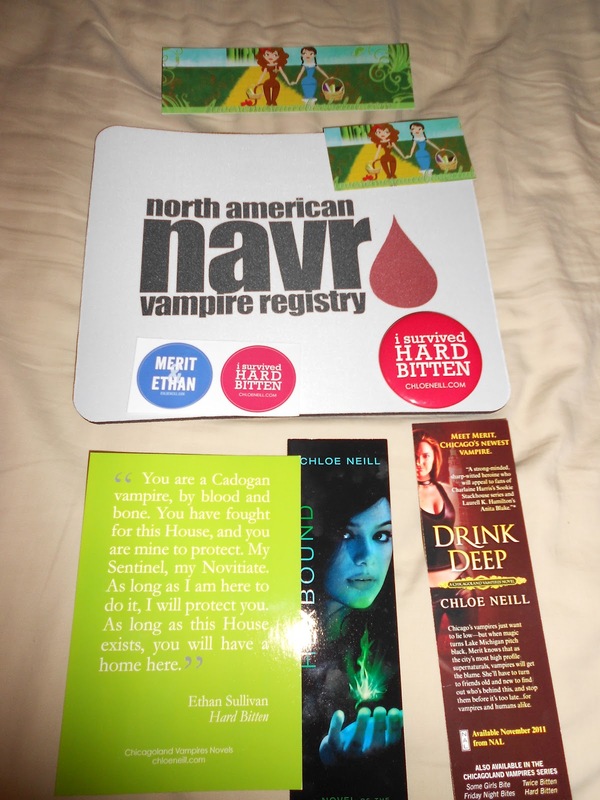 I'm so freaking jealous of the Chloe Neill swag, I so need a Hard Bitten button! Pocahontas rocks! Must have seen that movie like 20 times when I went on vacation last month. Colors of the wind is magical! OK, now for my disney-related comment because nobody else loves Disney like I do except you. Have you heard of Disneybound? Its a tumblr blog of this girl who puts together the most awesome disney inspired outfits. I could spend hours on that site. Thanks for stopping by my IMM! Enjoy your cool stuff! i love the tshirt, and very cool movies too! 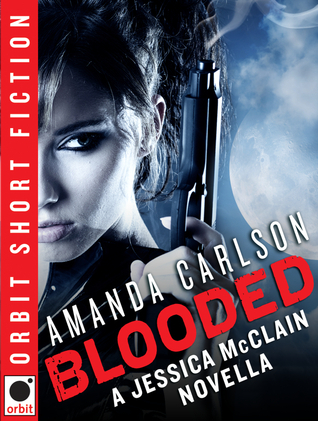 I really enjoyed Blooded and hope you do too! Awesome swag pack and I always love your shirts! New urban fantasy from Orbit? HOW did I now know this? Off to research. A mouse pad! Wow! Congrats on winning all this amazing swag! Lots of awesome swag and such. YAY Pocahontas! Happy Reading! Sometimes, not adding to your TBR pile is a smart idea. I should do that more often than not. But yay on getting swag! That's always a good alternative. Thanks so much for passing by my post. I appreciate the comments.